Play the Game. Join the Show. Win your 15 min (or 15 seconds?) of fame on the show. The ten Ark Hunters who complete the most Major Arkfall events between July 8th (10am PDT) and July 30th (10am PDT) will compete for a chance to have their character written onto the show. These ten semifinalists will be fleshed out with backstories written by the show’s writing staff, which will then be featured on Facebook, where Defiance fans will choose their five favorites. 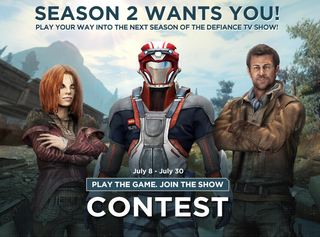 From this pool of five finalists, a member of the Defiance team will select the final winner to appear in Season 2 of Defiance. This past April, Defiance gamers competed to appear on “Most Wanted” posters on an episode of the TV show. The winner was Zachary P., with an incredible 173,383 ark salvage/hr – that’s 109,969/hr over the average Ark Hunter haul. This new contest gets a players' actual in-game character to be a part of the TV series. I can't tell if that means a walk-in part as an actor or your game character added digitally. A quick glance at the comments catches people complaining that no one who works a day job can rack up enough points to win.